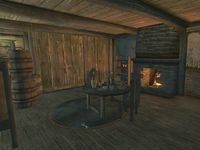 Ungolim's House is a home located on the north side of Bravil, adjacent to Ranaline's house. 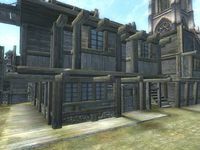 It is the residence of Ungolim, a Bosmer assassin. The house consists of only one zone, Ungolim's House. Ungolim's house is a small and fairly unremarkable two-story home. After opening the front door, you will find two barrels containing clutter to your immediate right with a pumpkin and grain sack situated on top of them. Heading south past the barrels will take you to a small dining room illuminated by a cozy fireplace located in the southern part of the room. After entering the room, you will find a locked chest containing armor to your immediate right. In the center of the room are three chairs and a table that holds three radishes, two ears of corn, a cheese wedge, an apple, and a carrot along with some tan dishes and pewter dining ware. A leek can be found on the ground near the table. North of the table is a cupboard containing ingredients with a pumpkin and a watermelon resting on top of it. In the northeast corner of the room are five barrels that all contain clutter. Located in the southeast corner of this room is a cabinet displaying some tan and metal dishes. The southwest corner of the room is fairly empty and only contains a barrel that simply holds clutter. Outside of the dining room located near the steps leading to the second floor are three barrels containing clutter, a chair, and a table that holds a planter. The second floor of the house greets you with a small area that serves as a study. 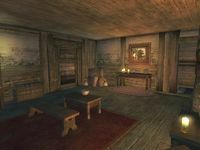 The eastern part of this room contains a table that is decorated by some silver dishes and candles and a stack of sacks and crates that all hold clutter. The center of this room contains a table that displays a silver bowl and a bench. In the northwest corner of the room you will find a locked chest containing some gold and a chance of jewelry and a cupboard that contains clutter. In the southwest corner of the study is a set of drawers containing clothes along with a table that displays a planter and a candle. 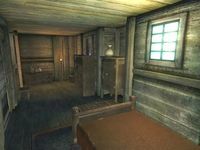 Behind a locked reinforced door located in the northern part of the second floor of the house is Ungolim's bedroom. In the eastern part of the room is his bed and a locked chest that holds some gold and may also contain some jewelry. In the vicinity of the bed and chest is a sack and a cupboard containing clutter with another sack containing more clutter situated on top of the cupboard. Located beside this cupboard and across from a chair is a set of shelves containing clutter. A single bottle of Cyrodilic Brandy can be found on top of the shelves. In the west end of the bedroom is a set of drawers containing clutter with a planter and a sack containing even more clutter situated on top of the drawers. Ungolim carries the key to this location which is required to open the door to the house. Esta página foi modificada pela última vez à(s) 17h47min de 12 de julho de 2015.